This is Page 4 of 4 - the best of November 2011! 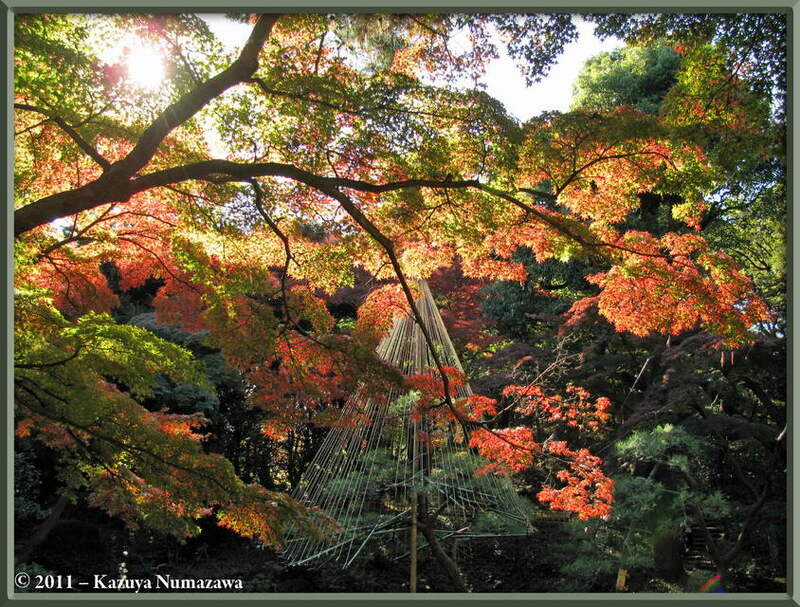 This page begins with November 25th and trips to Tonogayato Garden in Kokubunji and Fuchu no Mori Park in Fuchu City. 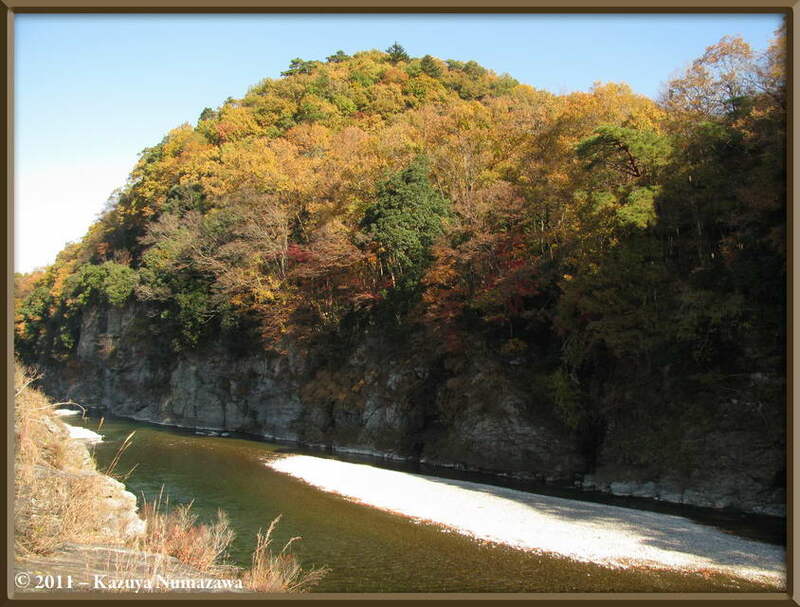 Then on November 26th we'll show you several photos of a trip to the Chichibu Area in Saitama Prefecture. That will end November. Click on any thumbnail to begin. 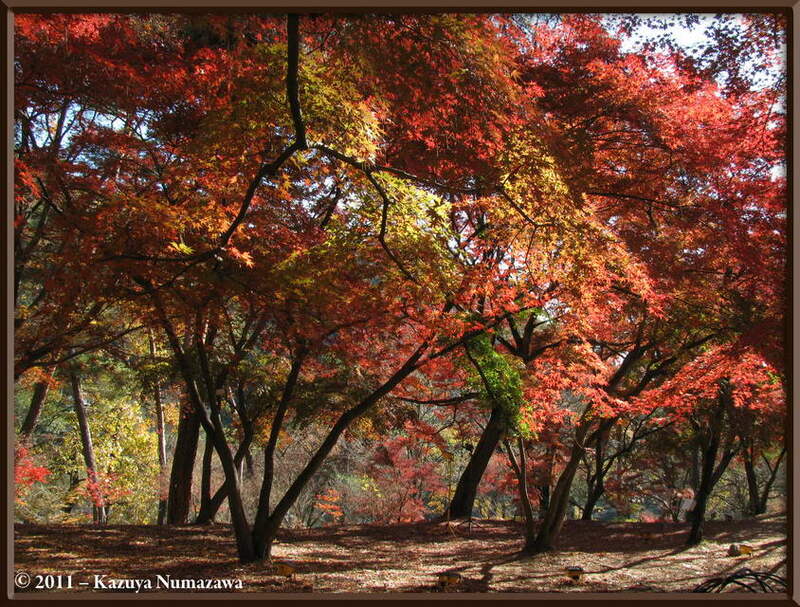 On November 25th we went to Tonogayato Gardens, in Kokubunji, to check out the Fall (Autumn) Colors. 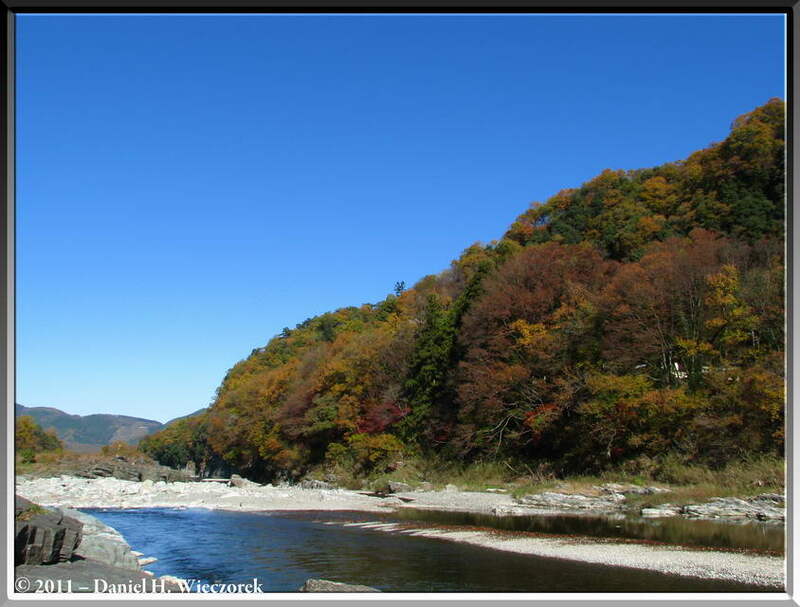 Usually we wait until December to come to this place, but Kazuya found a reference to it on the internet which said it was at the Peak of Fall Colors now. 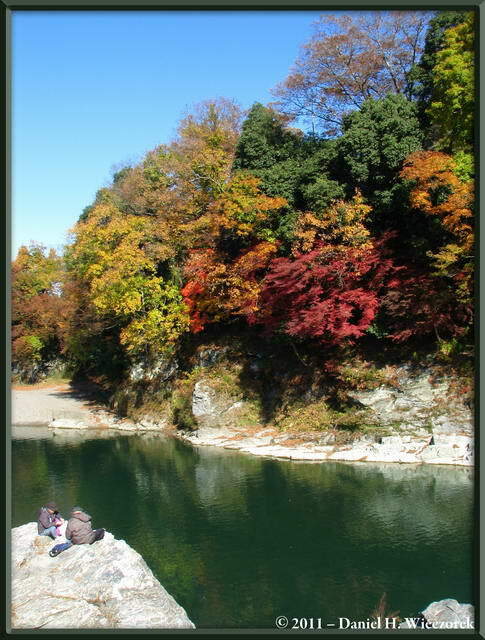 So, we headed off on our bicycles and rode for about 30 minutes to come here. We were disappointed - don't believe everything you read on the internet. We should have waited until our usual visiting time for this place - December. 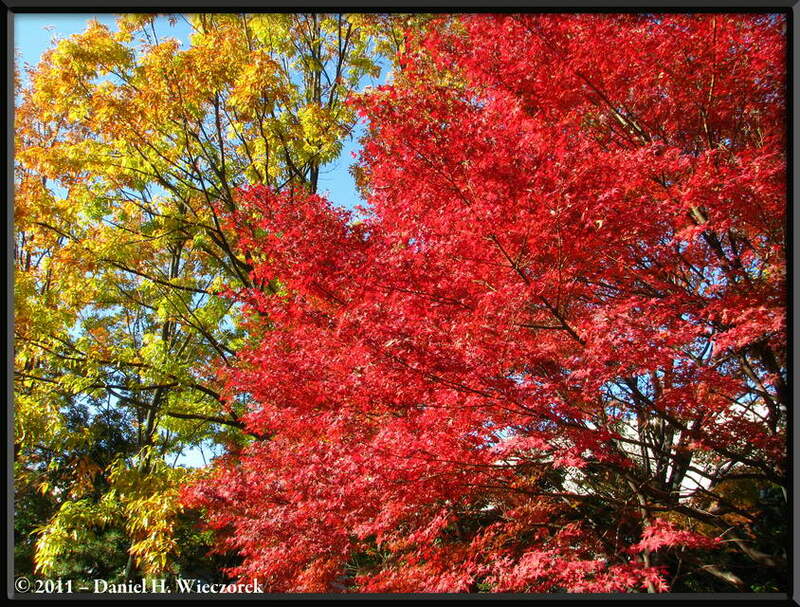 We did find SOME colors - in this row you can find 3 photos. 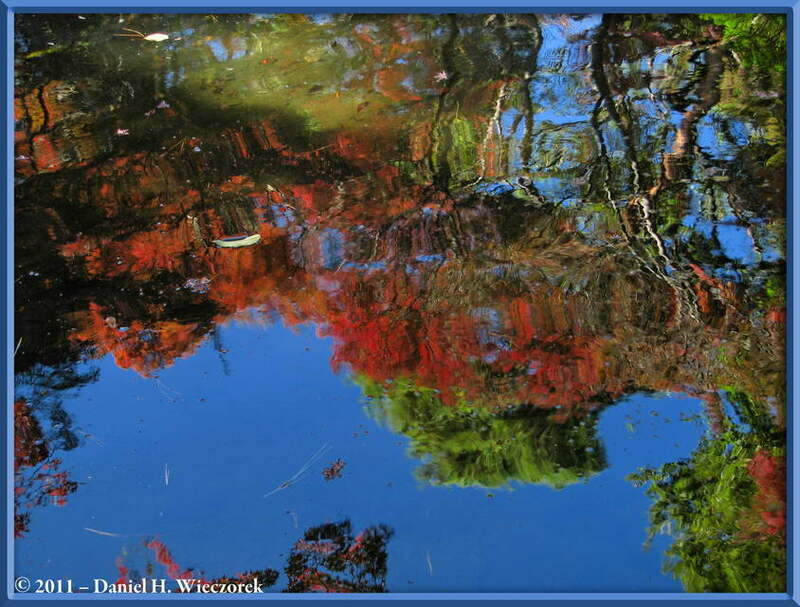 Note that the 2nd photo is of a reflection on the pond with the bright blue sky and fall colors showing. 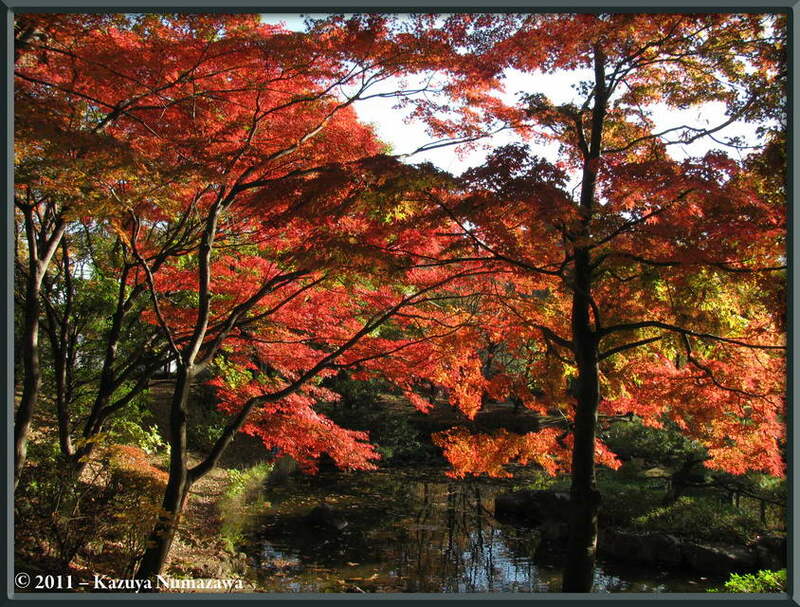 Here are 3 more photos taken in Tonogayato Gardens. That guy in the first photo is me. 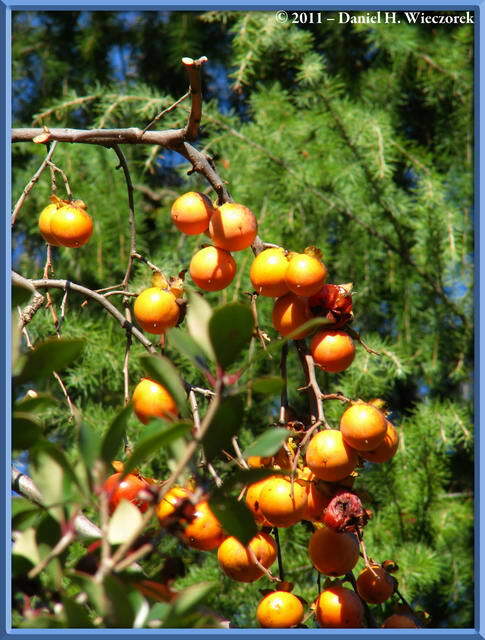 The first photo in this row is the final one from Tonogayato Gardens - obviously a Persimmon (Diospyros sp.) Tree. 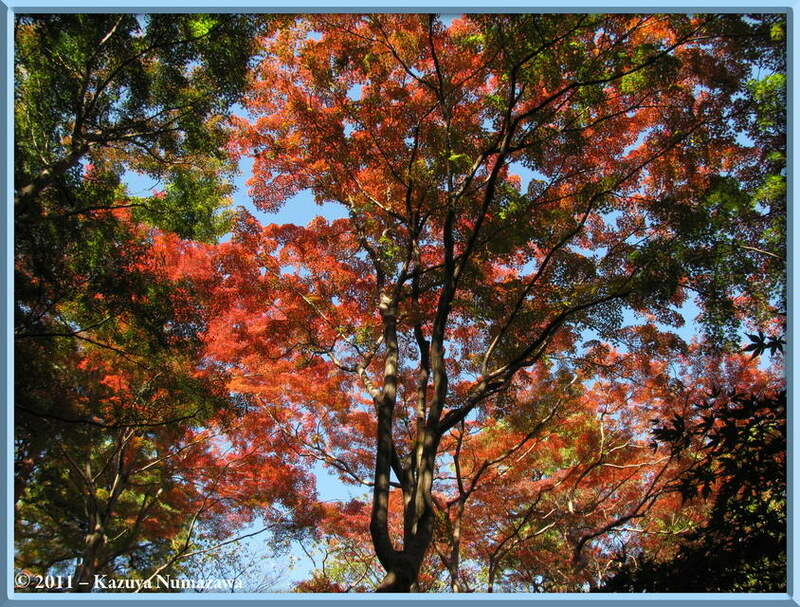 The 2nd photo was taken in Fuchu no Mori Park - a place we had never visited before. 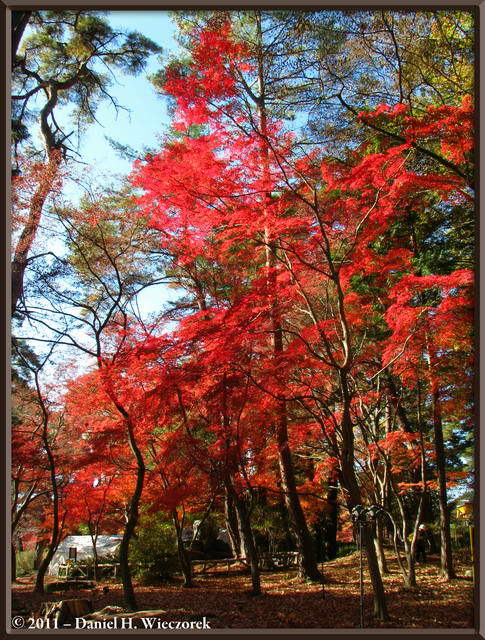 We bicycled home by a rather roundabout route and we happened to pass by this park and noticed some bright Red Maples from the street, so we stopped and came in to the park - it was free. 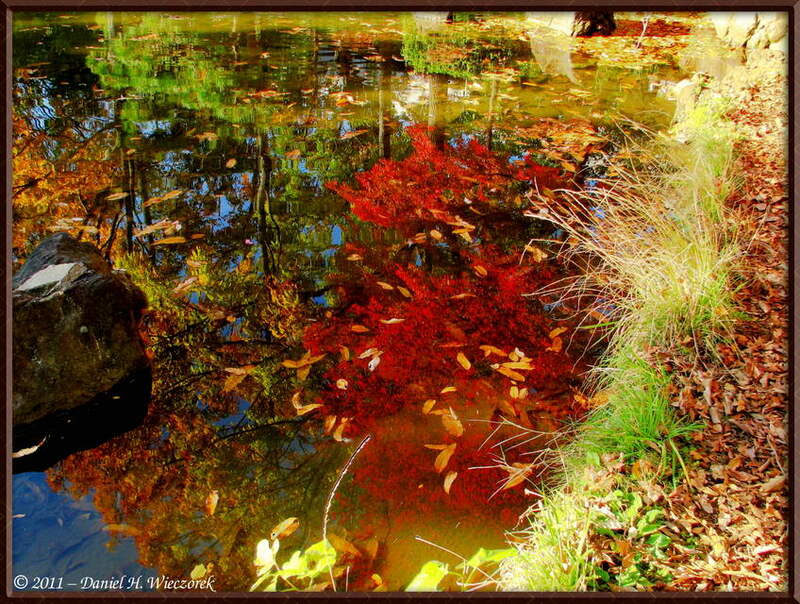 Both shots were taken very close to one of the ponds. 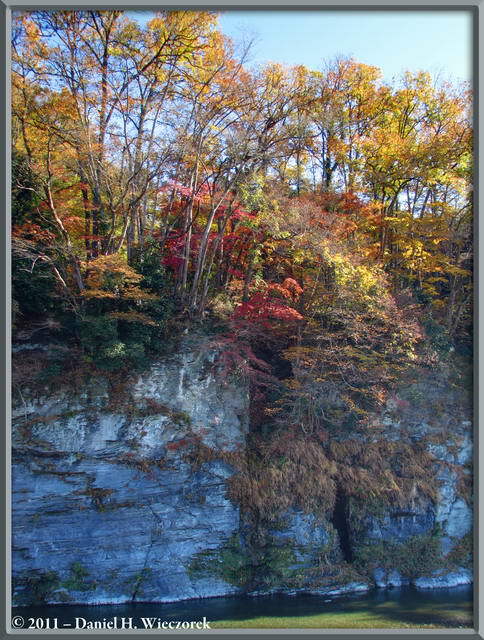 The first image in this row is a High Dynamic Range Photo - created from 3-exposure bracketed shots with Photomatix Pro using the Tone-Compressor Option. WOW! 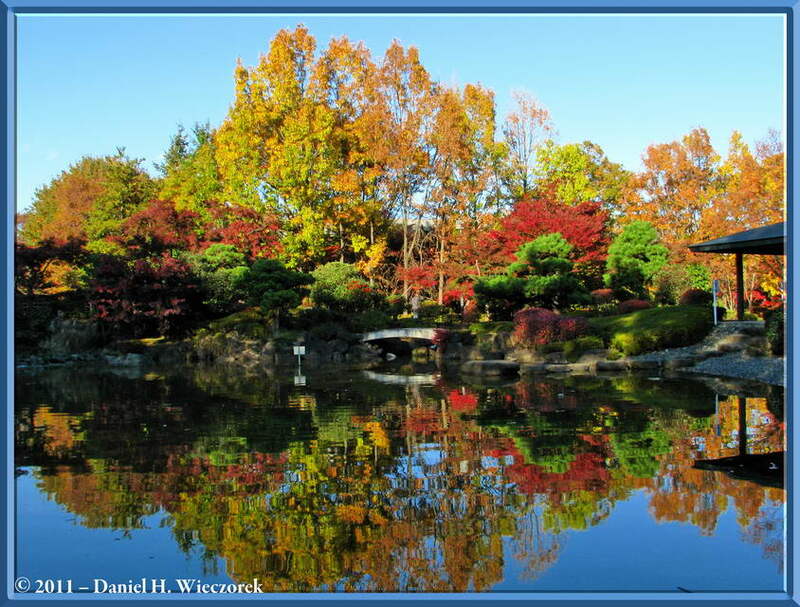 If you are somewhat confused - it is a reflection on the pond. 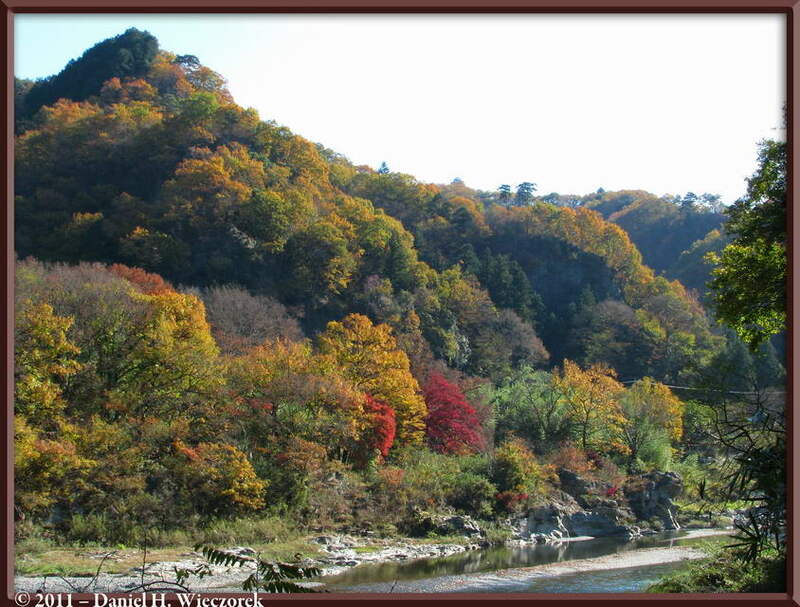 The 2nd shot exhibits some nice colors. 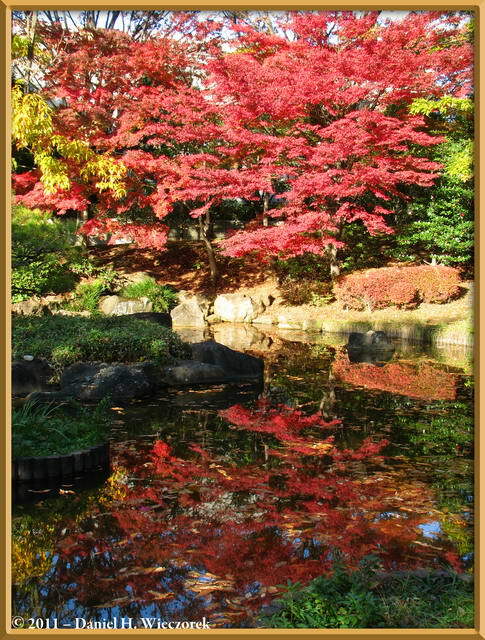 The 3rd shot was adjusted with Shadow Illuminator Pro - a reflection shot on a different pond, but also in Fuchu no Mori Park. On Saturday, the 26th, we went for our final outing of the month. We had talked about taking the Seibu Train line several times in the past - out to the Seibu Chichibu Area of Saitama Prefecture, but we had never done it before because it's a 2 hour trip and due to the fact that it's not so very far from home we had never thought it to be worth the effort. Well, we finally did it. It was worth the effort, but we probably won't do it again in the near future. 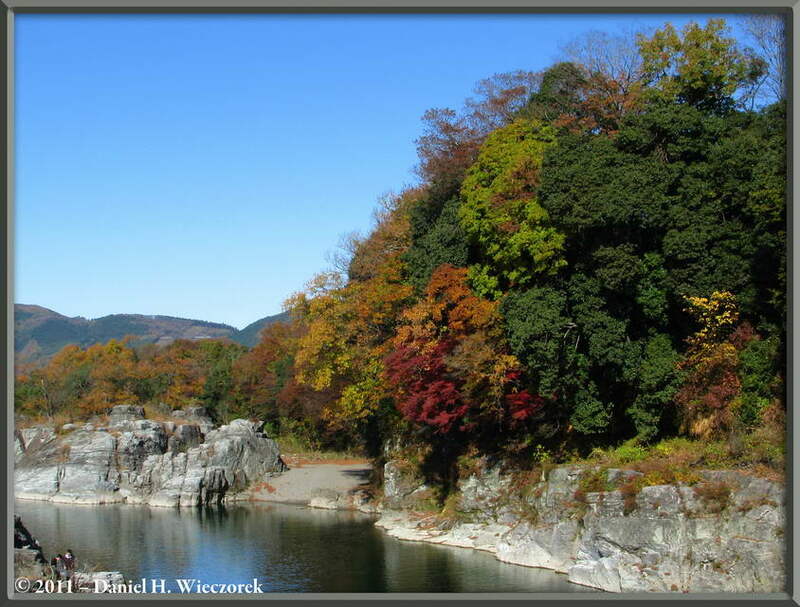 The first shot in this row shows the Arakawa River taken from the Iwadatami (Rock Ledges) at Nagatoro. 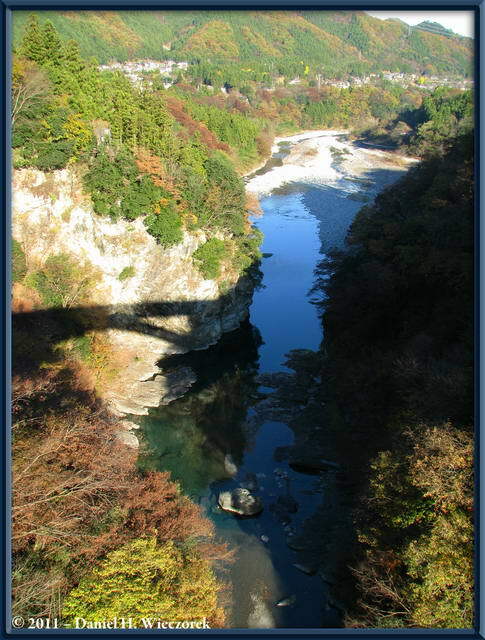 The beautiful blue sky is reflected in the river and you can also see one of the old style tour boats which people pass down this canyon in. We did not take the boat trip. 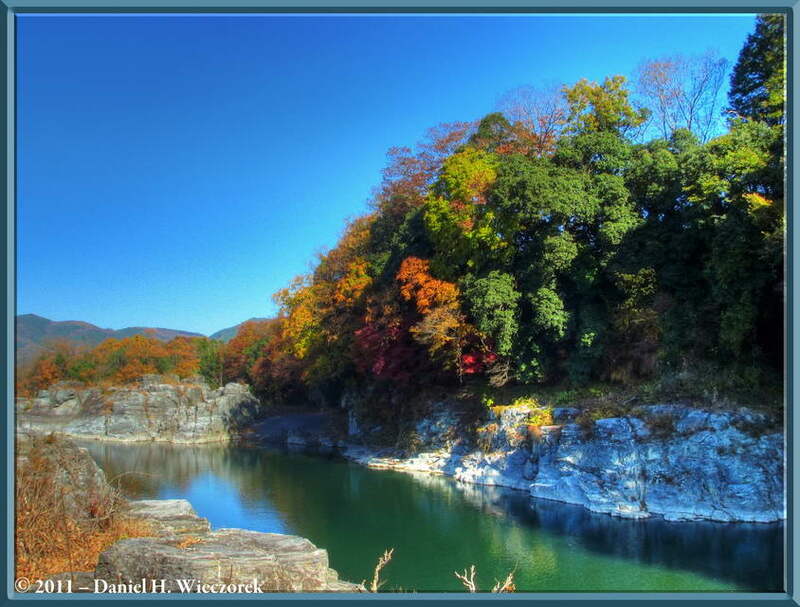 The 2nd shot is Tone-mapped from 3-exposure bracketed shots with Photomatix Pro's Details-Enhancer Option. The 3rd shot is the same thing, but in a slightly different location. 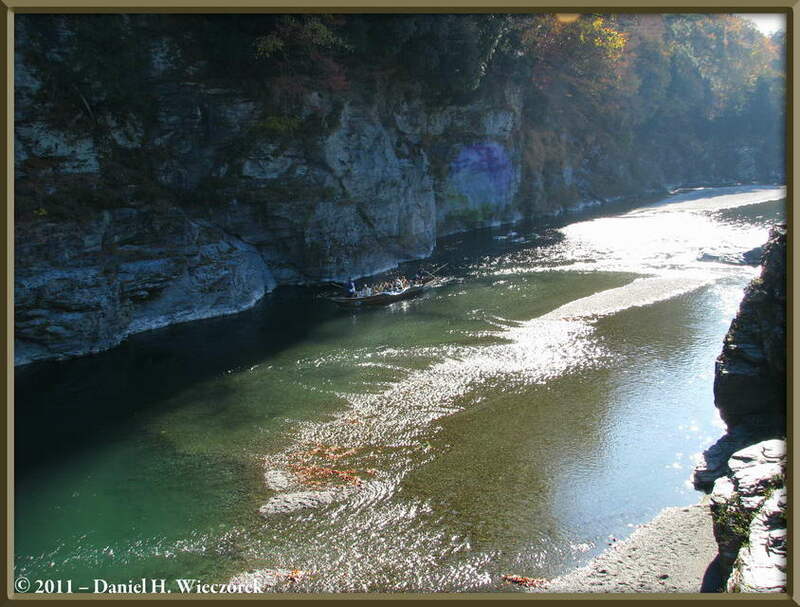 In this shot you can very clearly notice these Rock Ledges at Iwadatami and the sun's rays. 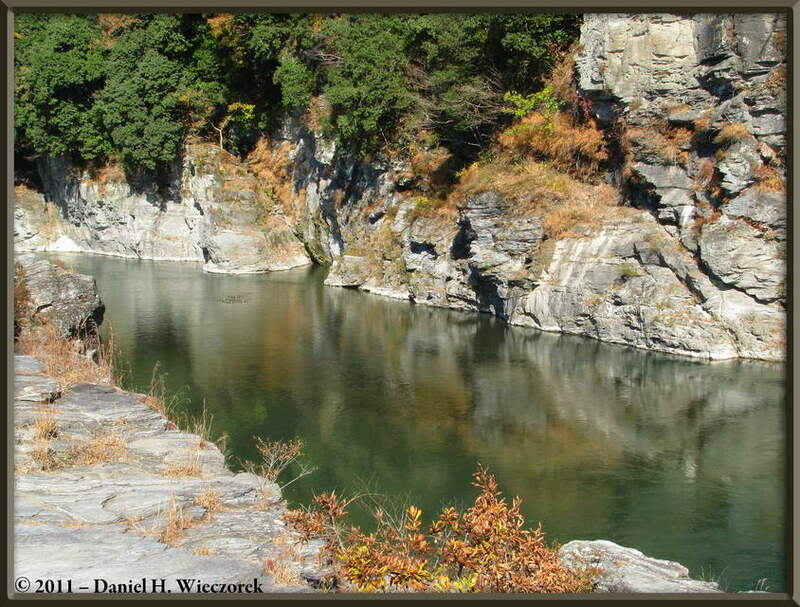 The 2nd shot, taken a bit further upstream, shows the rock ledges, a rest hut and the beautiful river. There are not many people wandering yet - there will be later on though. 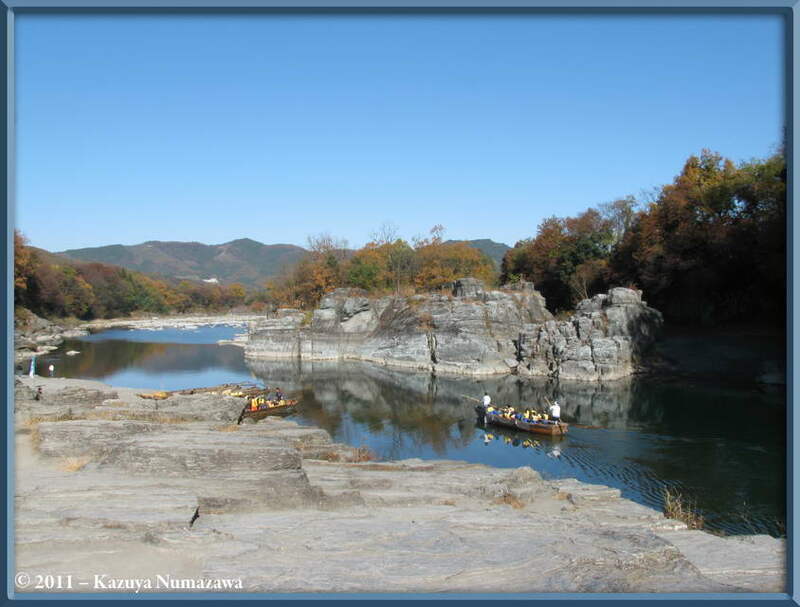 The 3rd shot shows another tour boat in the river canyon. 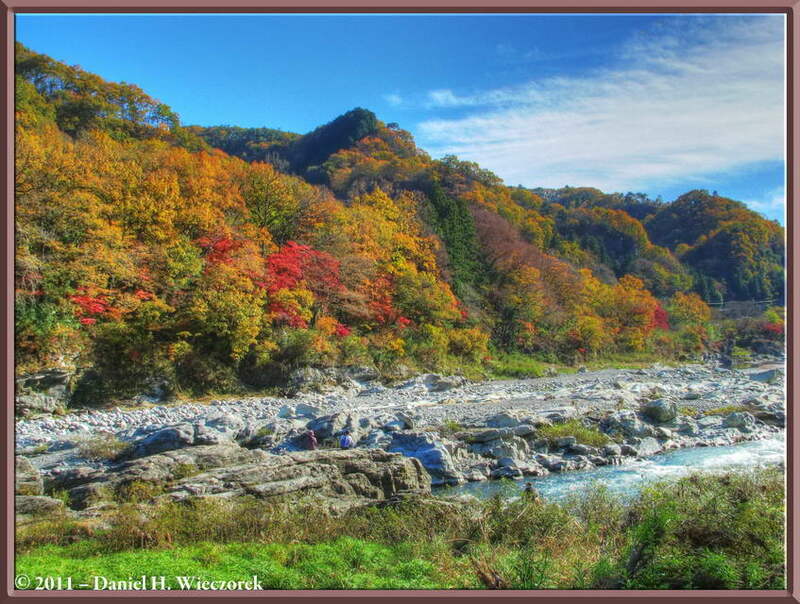 The first image in this row is another High Dynamic Range photo created with Photomatix Pro from 3-exposure bracketed shots of the Fall Colors and the Arakawa River. For this one the Tone-Compressor Option was used. 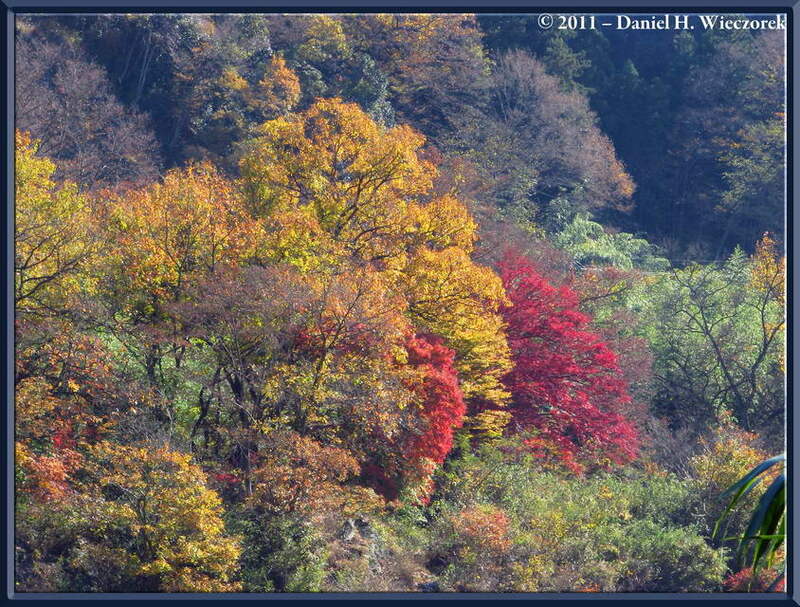 The 2nd image was created by FUSING 3-exposure bracketed shots with Photomatix Pro. The 3rd shot has not been manipulated in any way. 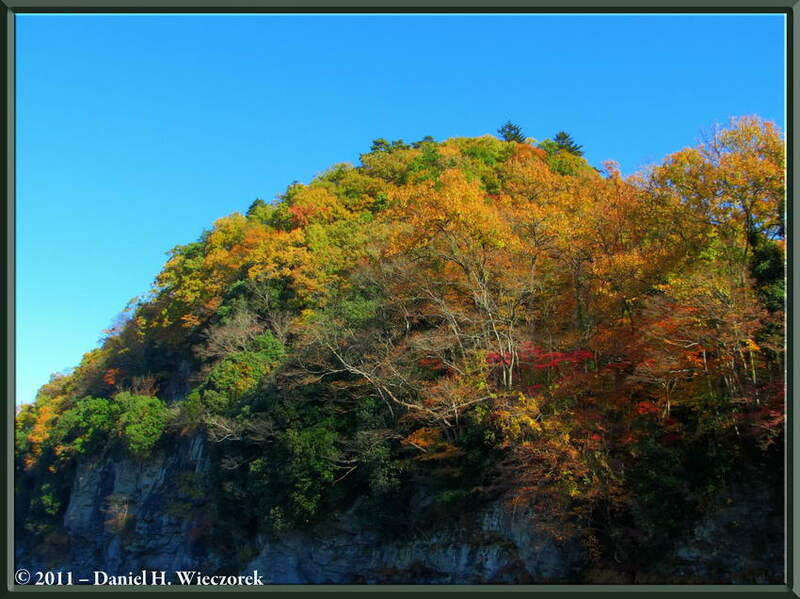 The first 2 in this row are very similar, but the 1st photo has not been manipulated in any way and the 2nd image was created - once again - from 3-exposure bracketed shots using the Tone-Compressor Option of Photomatix Pro. 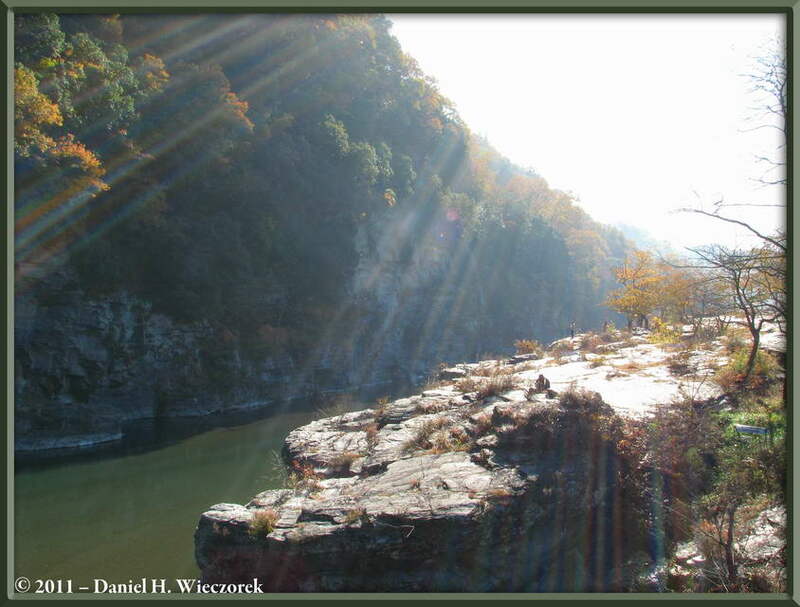 The 3rd shot was taken further up-river and has not been enhanced. 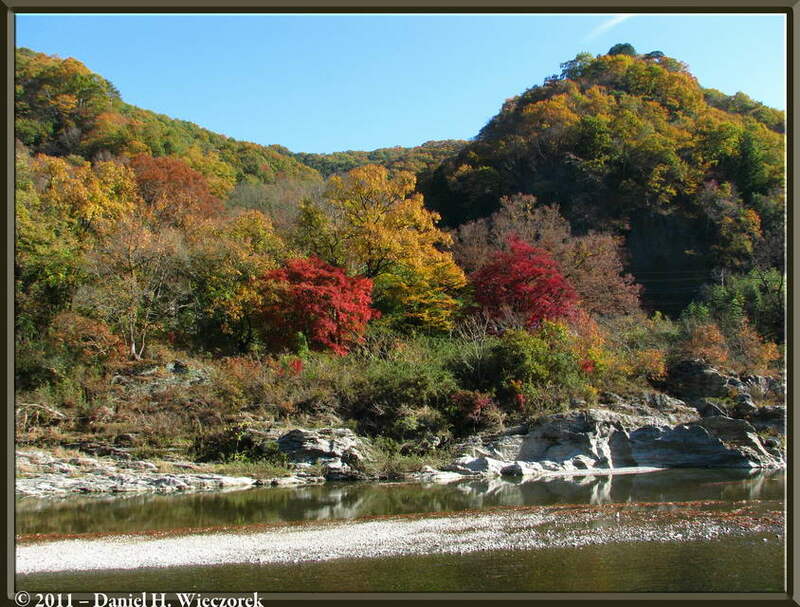 Here are 3 un-enhanced Fall Color shots at Nagatoro. 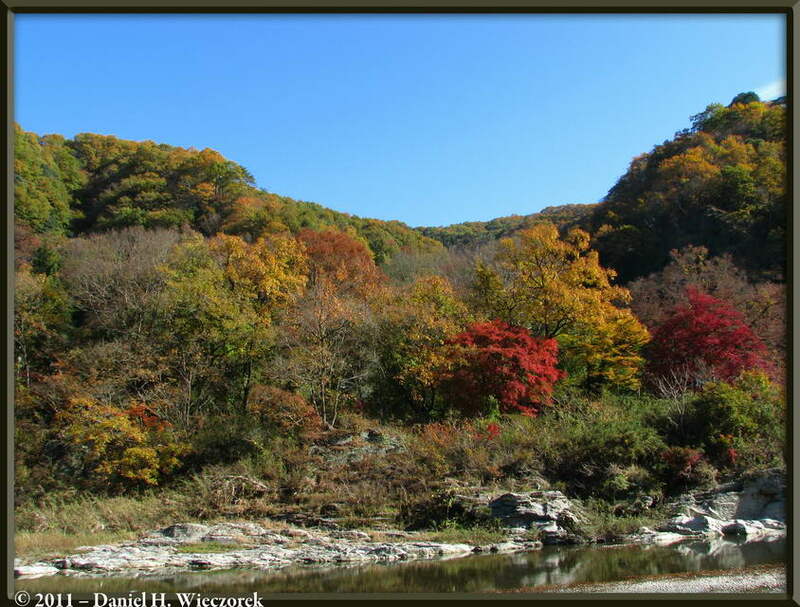 The 2nd image is a 2 shot panorama. 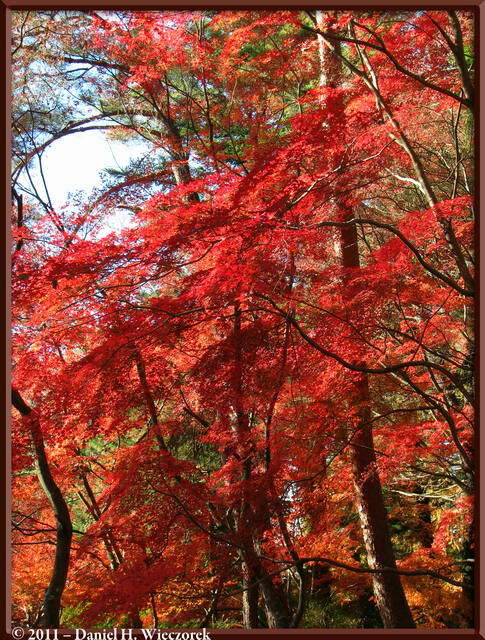 Getting closer to some beautiful red-leaved trees and taking photos of them as we walk along. 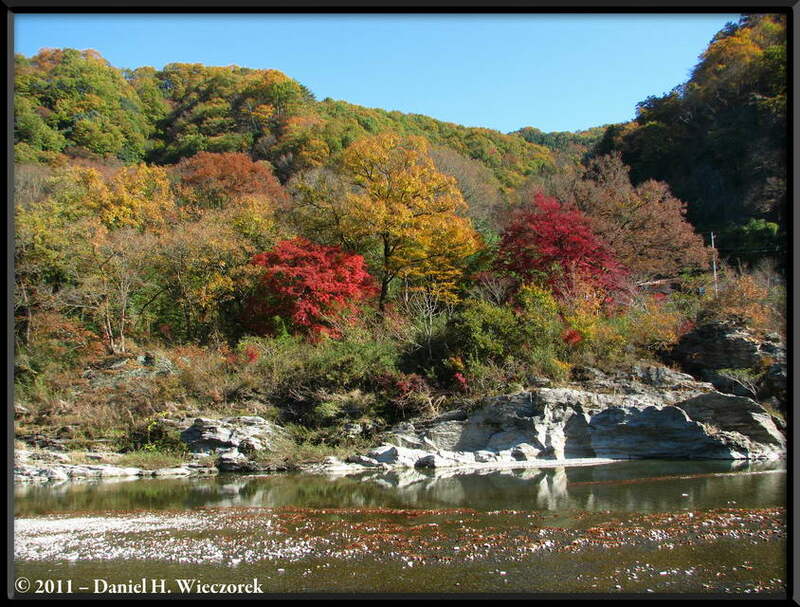 Continuing to walk up-river and take photos of those beautiful red colors as we hike. 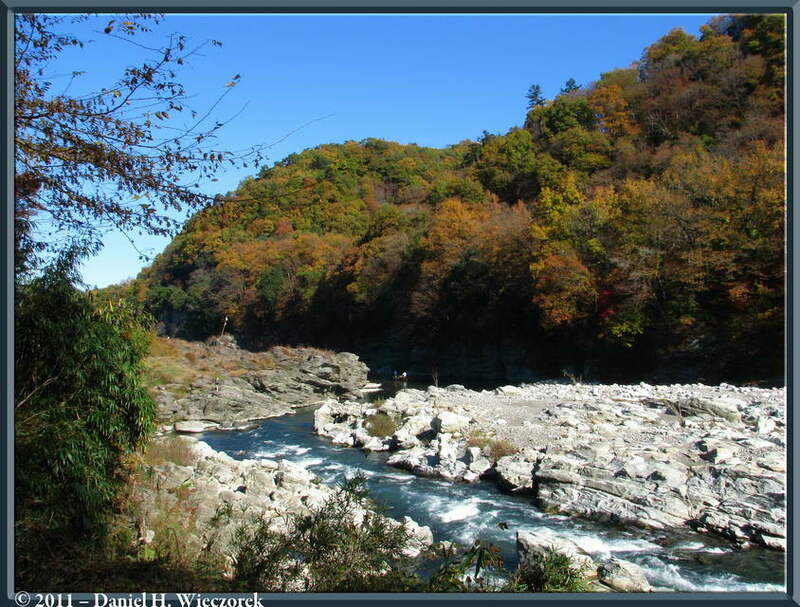 The 3rd shot was taken looking down-river. 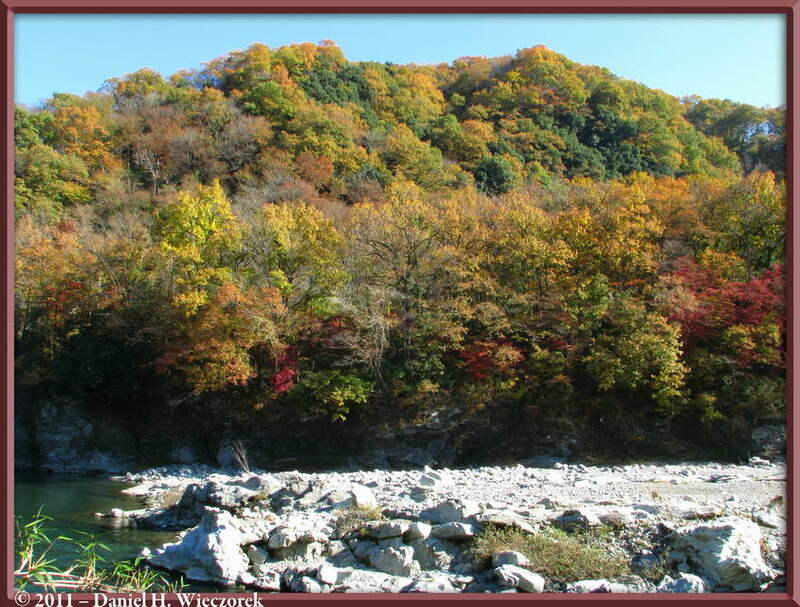 Now we have arrived as far up-river as we will go and we are at Tsuki-no-ishi Momiji (Maple Tree) Park. They have lots of lights here for night viewing. 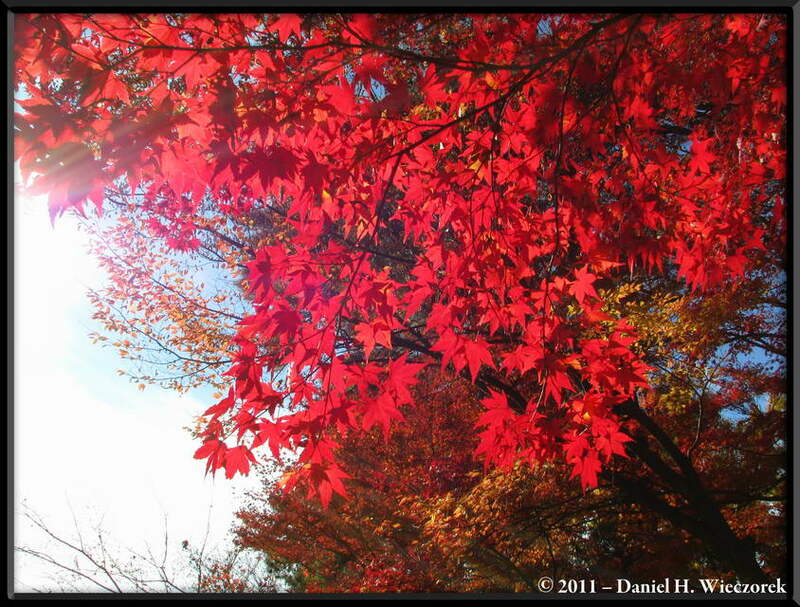 These 3 photos are of the most incredible Red Maple Tree which I believe I have ever seen. 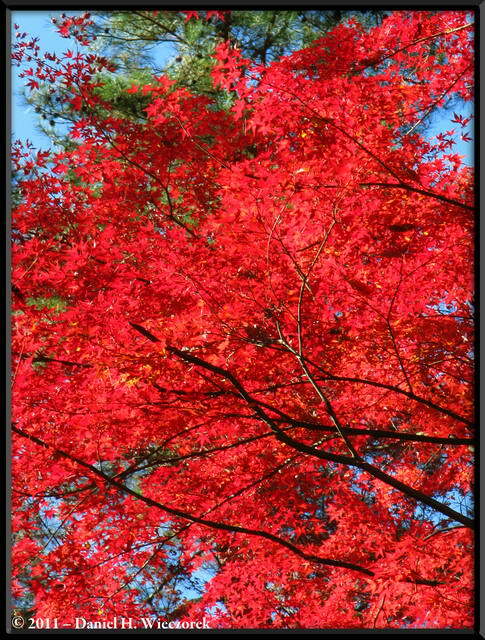 Nothing was done to increase the saturation of these photos - that tree was truly THIS red, if you can believe it! 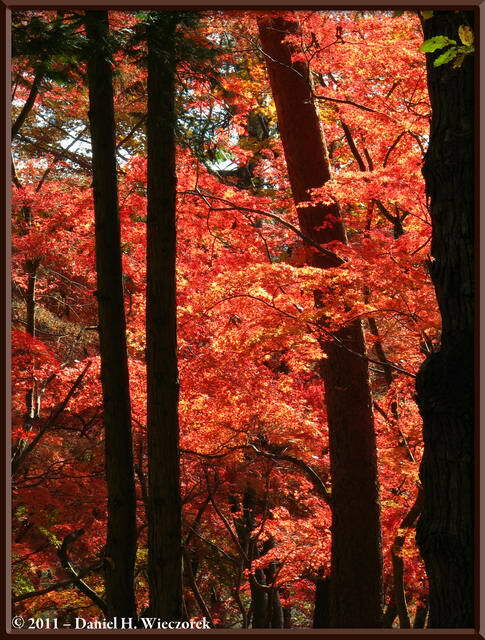 Here are 3 additional shots taken in Tsuki-no-ishi Momiji (Maple Tree) Park - the final three. 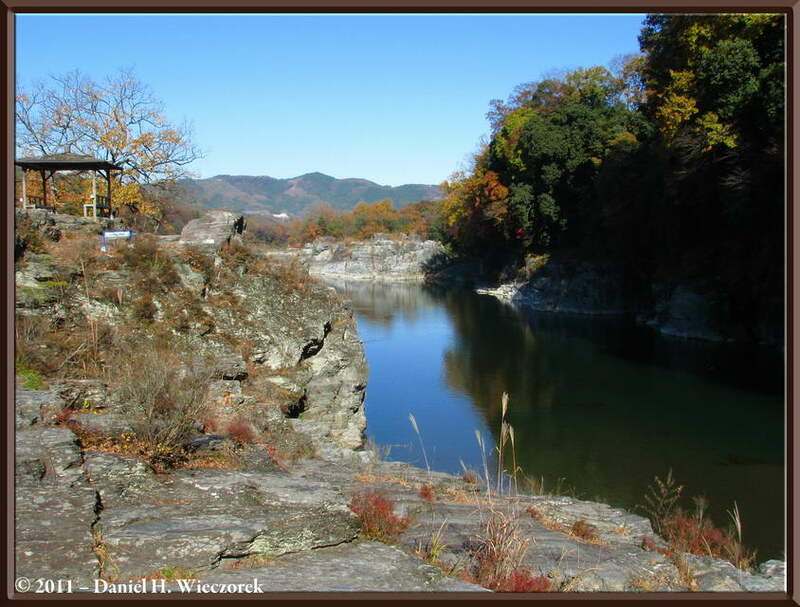 After this we hiked back down-river to our starting point. The light has now changed angles considerably, so we are hoping for some better views of areas which were in the shade before. The first image in this row is another which was created from 3-exposure bracketed shots with the Details-Enhancer Option of Photomatix Pro. 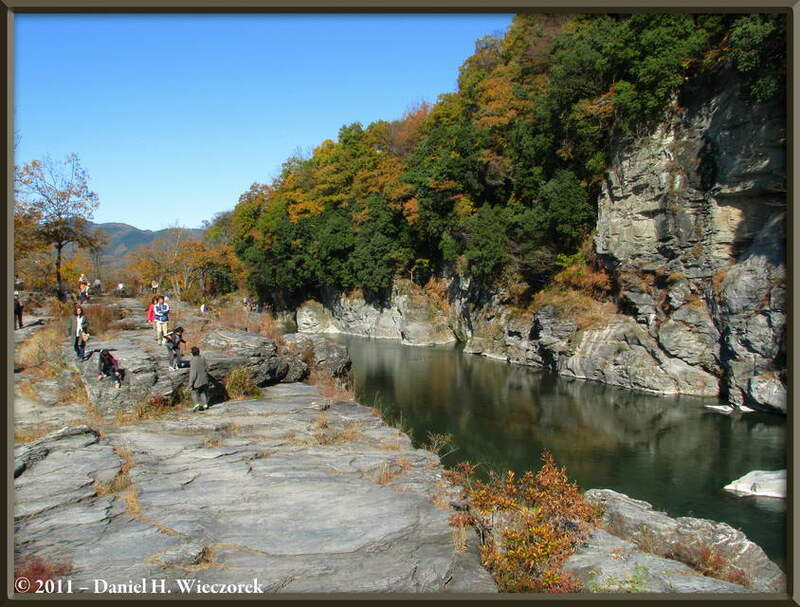 The next 2 shots were taken from the Iwadatami Rock Ledges as we hiked back down-river. You'll notice that there are now more people wandering around. 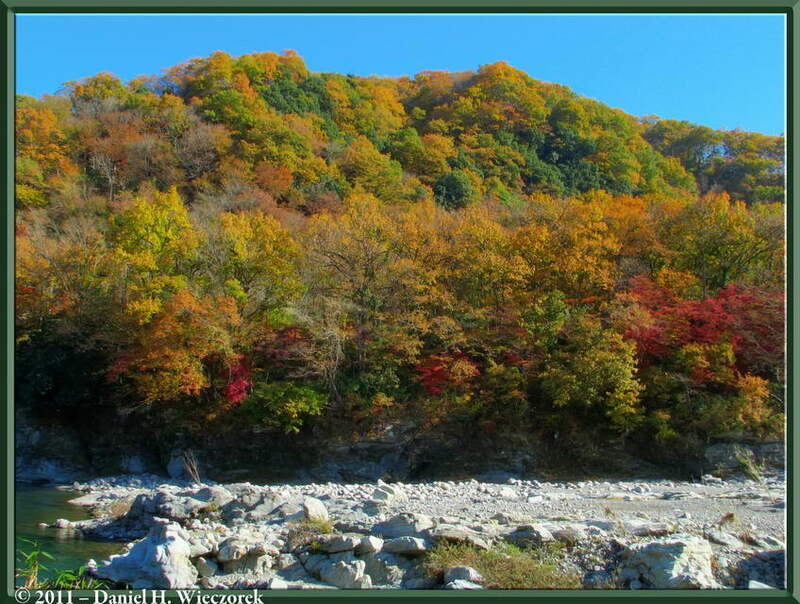 Please notice the colors reflected in the river here in the first shot. When we started this morning, the area in the 2nd and 3rd shots was totally shaded and we could not get any decent photos at all. Now, it's sunny and beautiful. 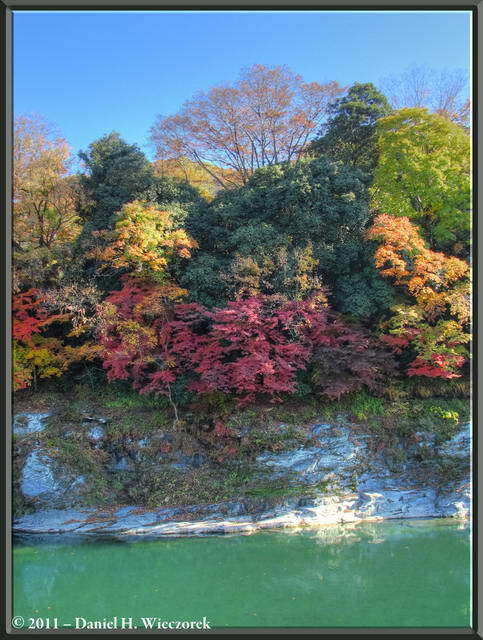 This 3-exposure bracketed image (Photomatix Pro - Tone Compressor Option) shows some amazing color - it shows a zoomed in area of the previous photo, the 3rd shot in Row 15. 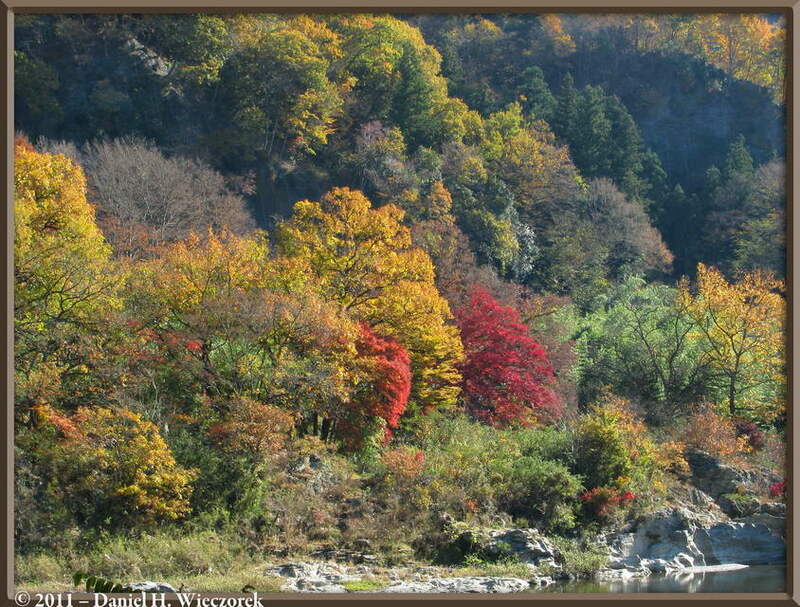 The 2nd shot is the same area - zoomed out to show a tour boat passing by. 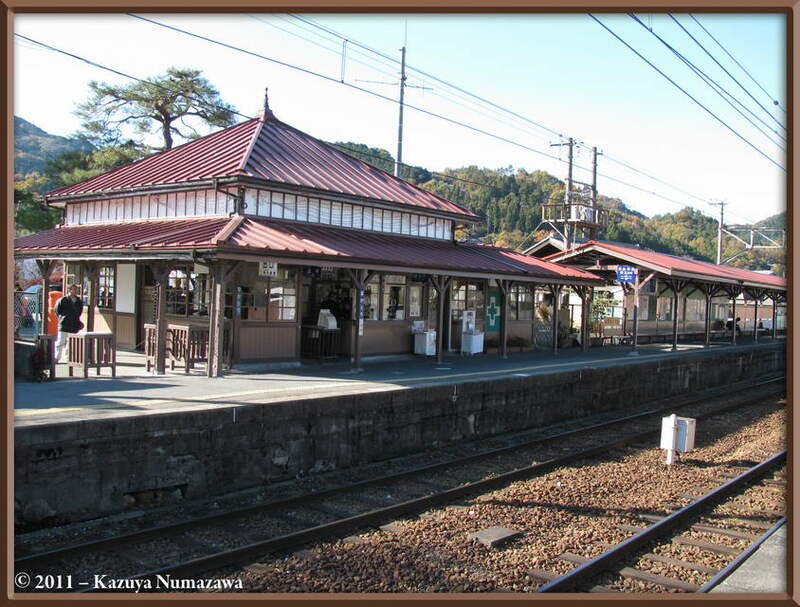 After this we ate lunch and then went back to the Nagatoro Train Station for a continuation of our trip. We bought a day-ticket this morning, so we need to go to as many areas as we can to pay for our ticket. 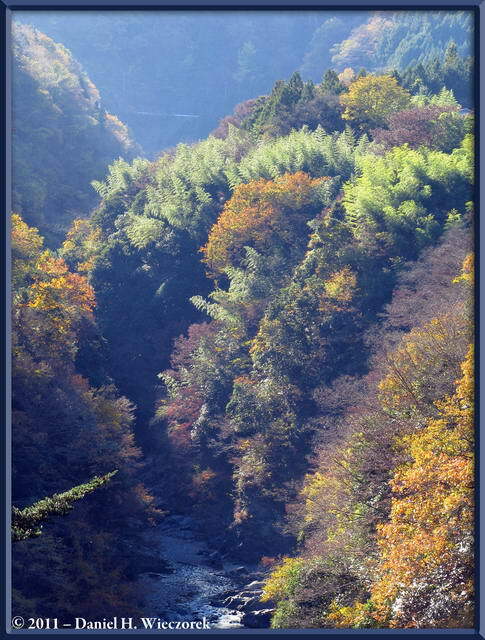 Now we are en-route to Mitsumine Guchi and the first shot in this row was taken from the train window as we traveled across a bridge. 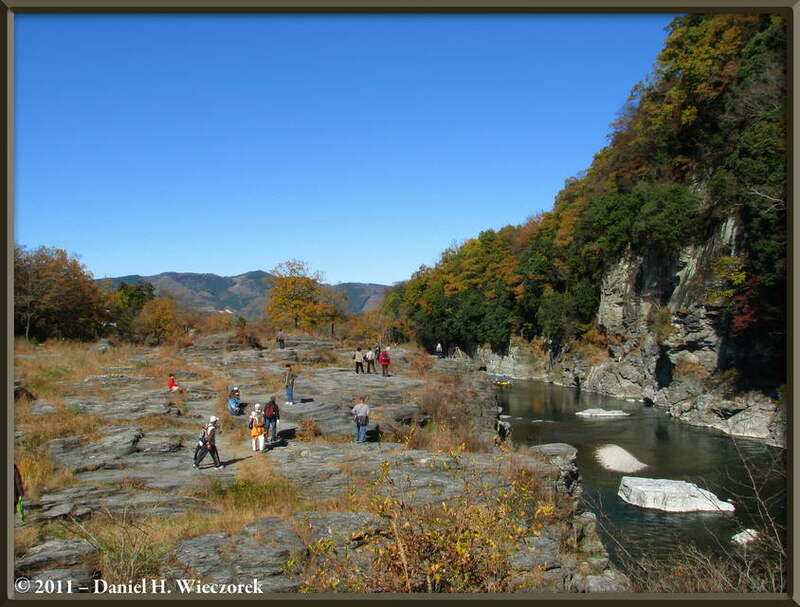 In the 2nd shot we have arrived at Mitsumine Guchi - the end of the train line - and we are hiking along the highway. 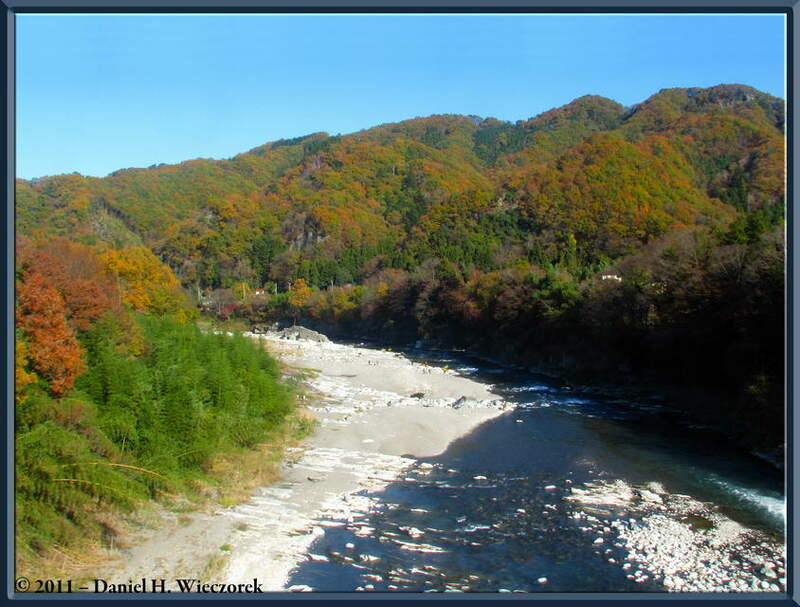 We are not familiar with this area, not exactly sure what we should be looking for, but the 2nd shot shows an interesting lighting effect in the bamboo trees as the sun gets lower in the sky. 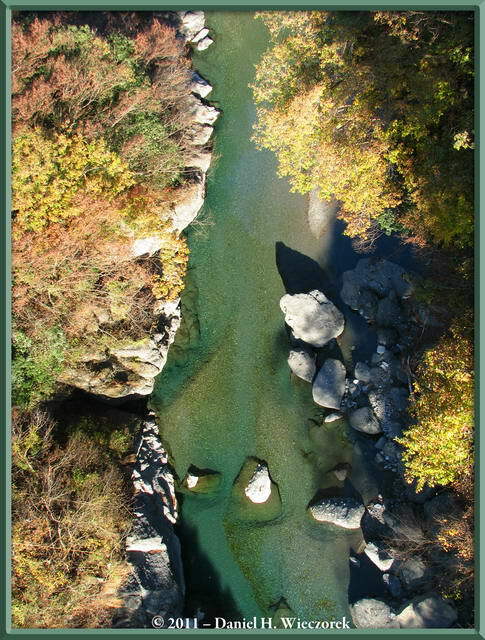 The 3rd shot was taken from the bridge we crossed as we hiked beside the road. 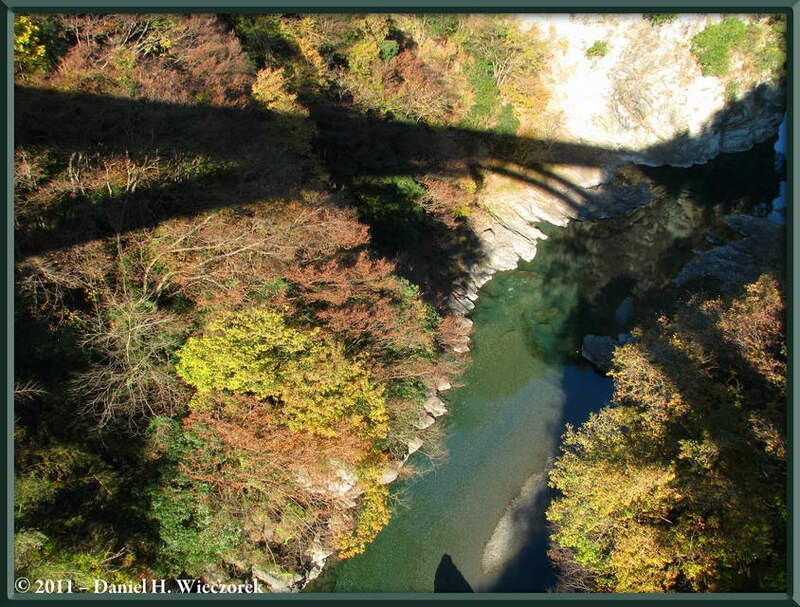 You can see the shadow of the bridge, which gives you a very clear idea of how far above the river we are. And, here are the final 2 shots from this one-day adventure. These were also both taken from the bridge. We could not find anything amazing to look at here, so after about 45 minutes we went back to the station and took the next train headed for home. Here are links to separate web pages - all of them will open in a new window (or new tab). The first link shows some photos of our DVD Collection, an AVI Movie of our Home Theater System and 9 photos of our Sharp Aquos TV. The 2nd link shows our entire DVD collection in DVD Profiler (if you're asking yourself what might be good to rent for the weekend). The DVD's will be sorted by date purchased. You can click on the "Title" Column to sort that way if you desire. The 3rd link shows our entire DVD collection in php DVD Profiler, which is much more sophisticated than the plain vanilla DVD Profiler just above it. The 4th link takes you to a set of pages which show you the FRONT cover-art of our entire DVD collection. 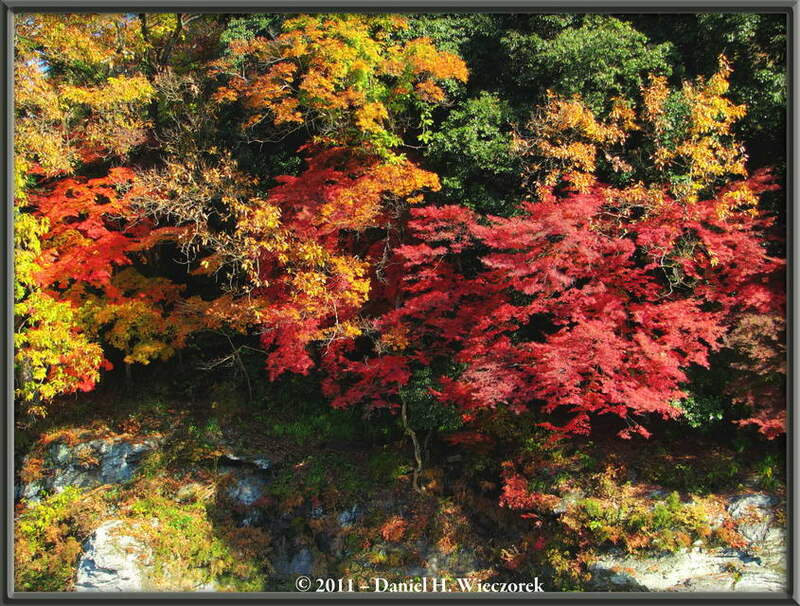 Here is a not so subtle hint that we'd love you to buy our book "Outdoor Photography of Japan: Through the Seasons". 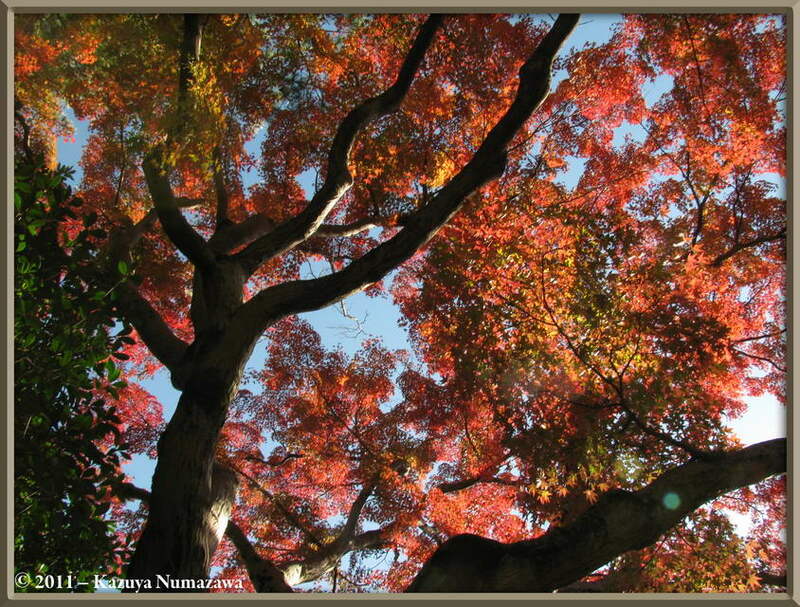 Here is a 272 page SAMPLE PDF file of this 362 page book (new window). Note that it is 28.3 MB in size!! I suggest that you right click on the link and select "Save Link As". Then after it's downloaded to your Hard Drive in a place where you can find it again, open it in Adobe Reader - version 9 or later (very important - it most likely will not open in a version earlier than 9). The best way to use Acrobat Reader to see what the book looks like as a book is to choose "View", "Page Display", "Two-Up Continuous" and also "Show Cover Page During Two-Up" and that way you'll see it exactly as the book will appear in print (odd numbered pages on the right and even numbered pages on the left). 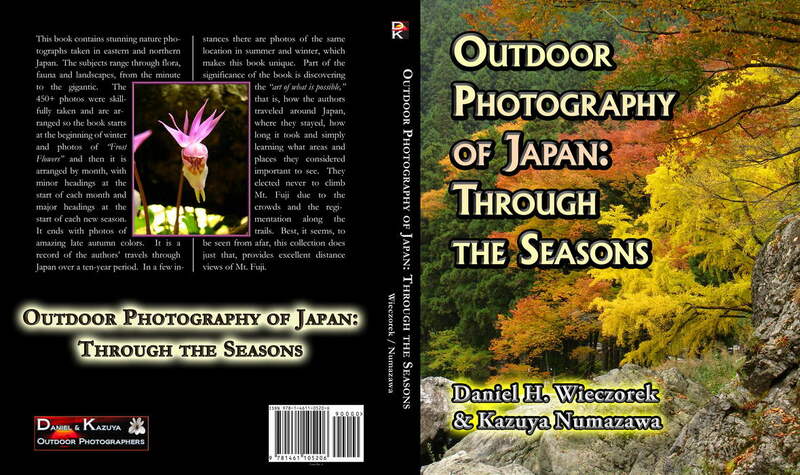 Here are the front and rear covers of Daniel & Kazuya's Outdoor Photography of Japan: Through the Seasons. Go to the Amazon.com sales page (Paperback Edition). Go to the Amazon.com sales page (Hardcover 8 x 10 inch Edition). Go to the Amazon.com sales page (Hardcover 6.14 x 9.21 inch Edition). Go to the Amazon.com sales page (Kindle Edition). We have a 2nd book which we'd also love you to buy. 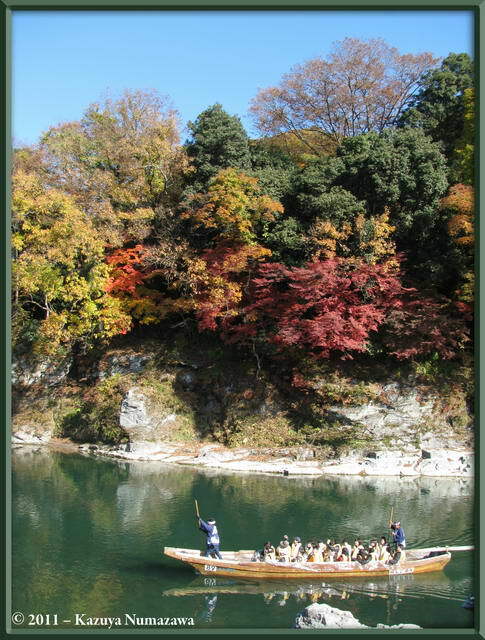 It is entitled "Some Violets of Eastern Japan - 2nd Edition". 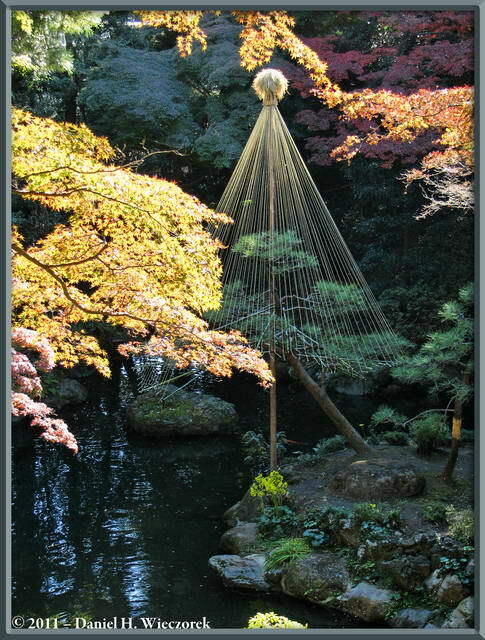 Here is a COMPLETE SAMPLE PDF file of this 118 page book (new window). Note that it is 6.75 MB in size!! I suggest that you right click on the link and select "Save Link As". Then after it's downloaded to your Hard Drive in a place where you can find it again, open it in Adobe Reader - version 9 or later (very important - it most likely will not open in a version earlier than 9). The best way to use Acrobat Reader to see what it really looks like is to choose "View", "Page Display", "Two-Up Continuous" and also "Show Cover Page During Two-Up" and that way you'll see it exactly as the book will appear in print (odd numbered pages on the right and even numbered pages on the left). 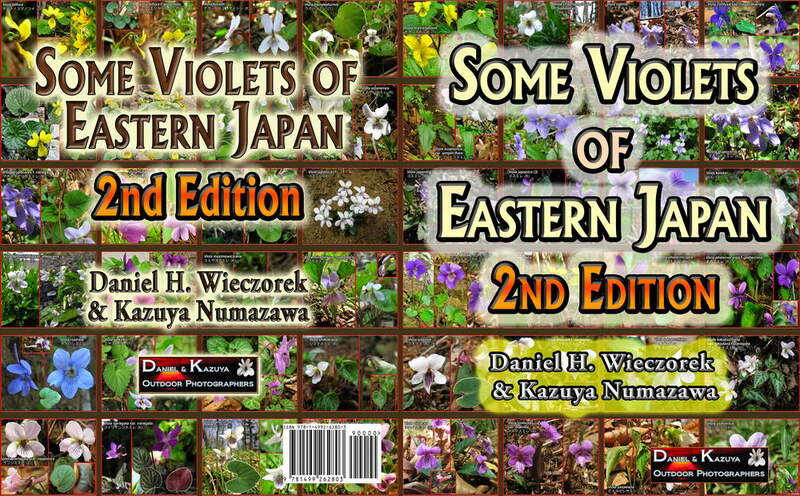 Here are the front and rear covers of Daniel & Kazuya's Some Violets of Eastern Japan - 2nd Edition. 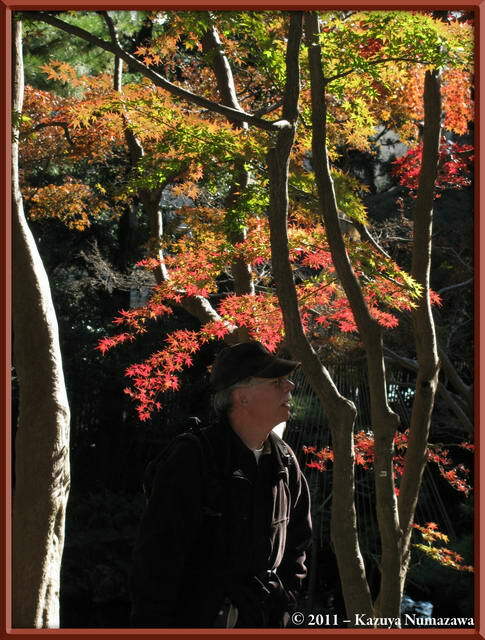 Go to the Amazon.com sales page (8 x 10 inch Paperback Edition). 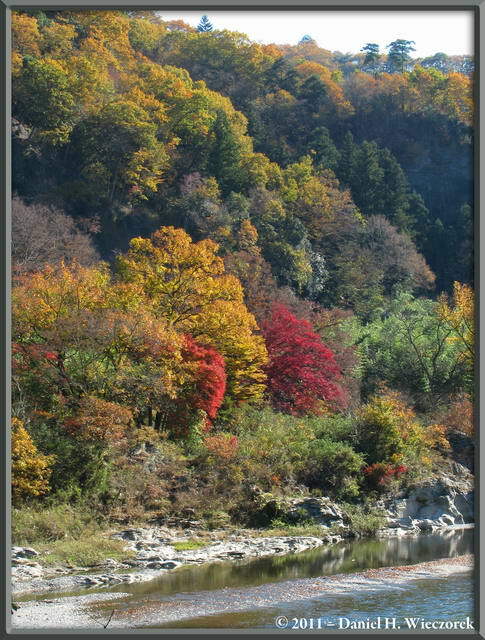 Go to the Amazon.com sales page (Paperback Pocket-Size Edition - 5.5 x 8.5 inch). Go to the Amazon.com sales page (Hardcover Pocket-Size Edition - 5.5 x 8.5 inch).